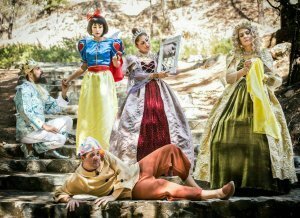 After their last production “The Three Little Pigs and Lykos Lilykos” the children’s theater Vestiario, returns with their new play “Snow White and the Seven Dwarfs” . The classic masterpiece of the Grimm Brothers comes alive on stage enchanting children and adults. A big production full of colors, splendid music, beautiful sets and magical costumes from another era. The play is an adaptation by the actor and screenwriter Yiannis Spanos. The goal of this performance is to give the correct messages to our children. They will learn about love and friendship. They will also learn to accept and to be accepted. Suitable for ages from 2 up to 102 years old.